Nerve pain, or neuropathic pain, afflicts many individuals. It may be temporary or chronic, intense and debilitating or aggravating. Individuals struggling with conditions like cancer, HIV, fibromyalgia, and diabetes often struggle with nerve pain, and medications, infections, and injuries can also be to blame. Cannabis for nerve pain has been relatively well-researched, and the results hold a lot of promise. Unlike traditional pain medications like opioids, cannabis can provide relief without the danger of fatal overdose or severe withdrawal. The journal of Neurology has published a number of studies on the topic of cannabis strains for nerve pain. In 2007, researchers explored the efficacy of cannabis in the treatment of nerve damage and nerve pain from HIV, and in 2014, a review examined the plant’s ability to reduce both neuropathic pain and muscle spasms in individuals with multiple sclerosis. Both studies highlighted the positive effect of cannabis. In 2015, the Journal of Pain found that cannabis, when inhaled as a spray, could reduce the nerve pain experienced by people with diabetes. The study also noted the temporary, potentially negative, effect of THC: the psychoactive “high”. There are, however, safe, effective alternatives to this popular cannabinoid. Research is indicating non-psychoactive CBD can also treat neuropathic pain, and equal amounts of THC and CBD in a cannabis strain or product offers considerable relief without intoxication. The options for treating pain with cannabis are nearly as numerous as the conditions and symptoms this incredible plant can treat; gone are the days when smoking a joint was the only choice available. Though smoking cannabis remains one way to find fast relief, vaporizing dried cannabis flower can deliver the same effect, as can vaporizing concentrates like shatter and oil. Cannabis-derived products like oils enable manufacturers to isolate the significant cannabinoids – such as THC and CBD – providing individuals with medicine specifically suited to their needs. That said, there are many benefits to consuming the entire plant, as well. Individuals seeking to ease their pain may choose to smoke or vaporize cannabis, but quick, short-lived relief is not always the goal. By ingesting cannabis – such as, FARM’s capsules –Individuals can create a delayed effect that lasts many hours. This is an excellent way to manage pain during the night, but always be mindful of dosage when you’re ingesting cannabis; it’s easy to consume too much without realizing it. 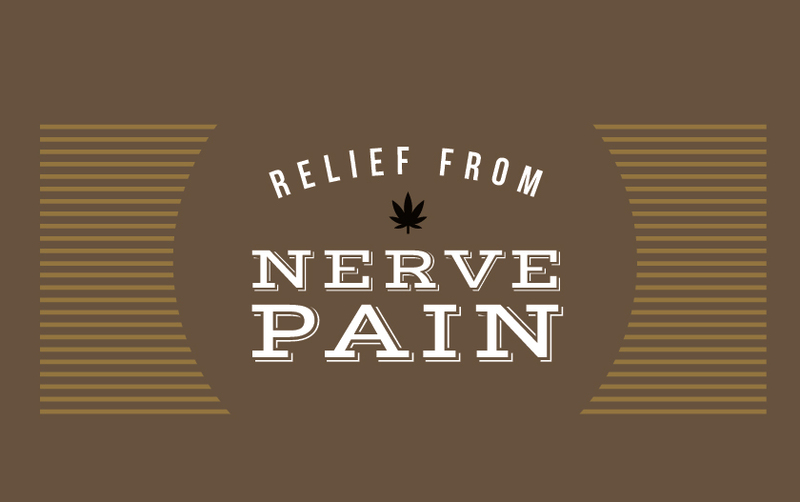 Other ways to use cannabis for nerve pain include tinctures – concentrates that are placed sublingually under the tongue with a dropper – and topicals, which can treat the precise location of the pain. FARM is well-stocked with excellent cannabis strains and products that can tackle both minor and severe pain. Turn to a high CBD strain flower to treat pain and spasms with minimal psychoactive effect, or vaporize an indica shatter for intense relief during a quiet weekend at home. Pain-fighting products like CBD capsules and our THC and CBD-balanced grapeseed oil tincture allow you to administer your medication subtly, and our wide range of topicals provide site-specific relief for joint and muscle neuropathic pain and spasms. Speak to one of our savvy FARM staff members to learn about the best cannabis strains for your pain, and discover fast, reliable, and natural relief.